The SnakeHead is an action-packed pattern suitable for many different gamefish species. 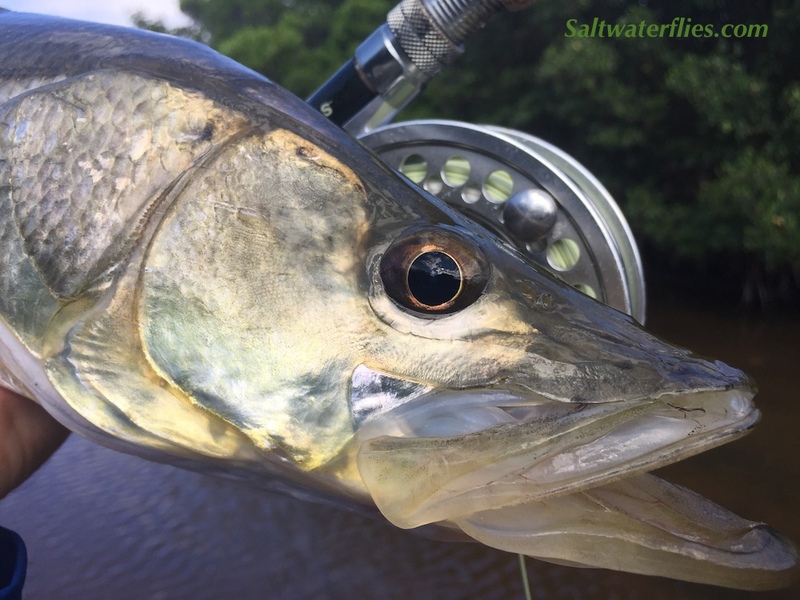 Tarpon, Redfish, Striped Bass, Snook, Largemouth Bass, Peacock Bass, and more - maybe even Snakeheads! Lightly weighted eyes keep this fly below the surface, but still riding towards the top of the water column. Soft fur tail has a nice wiggling action in the water, and the wide head creates sound vibrations that help fish find the fly - in clear water or stained. The SnakeHead Fly is approx 4 inches (10 cm) long, and tied on super-sharp, strong Gamakatsu SL12 #1/0 saltwater hooks. Tied by Taylor Topliffe. A little Snook Magic. Photo by Taylor Topliffe.